Hey there Podcasters! 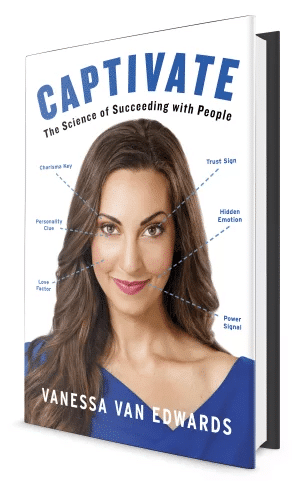 We are so so grateful for your support of both the Science of People and my new book, Captivate. As an avid fan of listening to podcasts, it’s such a fun experience to be a part of the creation process so thank you thank you! I’ve put together a resource page exclusively for our Podcasters. I hope you enjoy! Read the full killer conversation starters post. The face is the window into the soul–if you know how to read it. The good news is we can already tell a lot about someone by their face. Knowing how to read and interpret microexpressions is an essential part of understanding nonverbal behavior and reading people. Read the guide to reading microexpressions post. For understanding personality: Are You an Ambivert? Like most people, I don’t quite fit into either category. In this article and video I want to introduce you to the concept of an ambivert. Read the full ambivert post. Do you know how to speak with your hands? Holler and Beatie found that gestures increase the value of our message by 60%! The best, most charismatic speakers and influencers know the importance of using hand gestures. Read the full hand gestures post. In addition to combing through thousands of academic studies for our articles, we also conduct our own original research at the Science of People and would love for you to be a part of it. Interested in having me on your show?